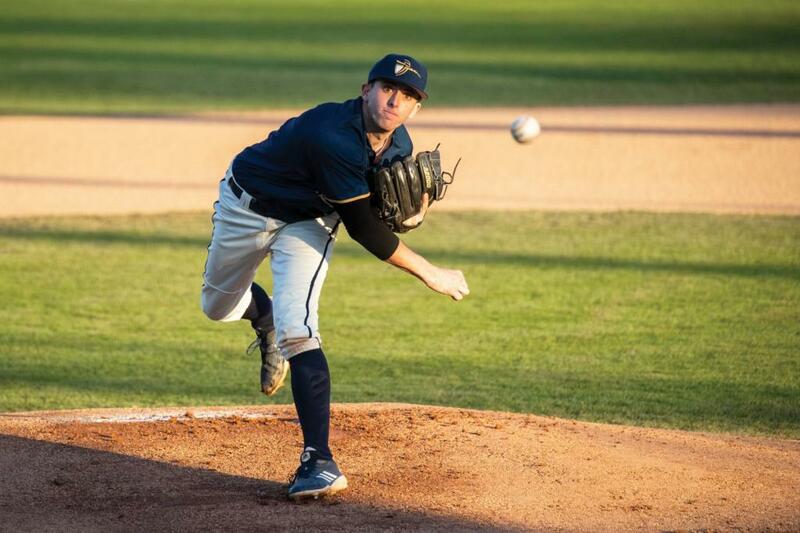 The winter sports seasons are winding down and hindsight is setting in on what has been a mainly successful first Division I winter for California Baptist University athletics. For Lancer basketball, it is hard to draw too many conclusions from inconsistently difficult schedules for both the men’s and women’s teams. However, there are a few results that are hard to argue. For the men, wins range from statement victories over Western Athletic Conference favorite New Mexico State University to blowout dismissals of NCAA Division III schools, such as the University of La Verne and the California Institute of Technology. However, this transition to DI has included many milestones for CBU. The Lancers, with a current record of 15-13, have accumulated 11 wins over DI opponents. Since the 1996-97 season, only nine of the 49 basketball programs to make the jump to DI posted at least 10 wins in their first DI season. Grand Canyon University is the only men’s hoops program to play in a postseason game in its first DI transition year. The Lancers are currently eligible for both the College Basketball Invitational and the College Insider Tournament. Four WAC schools — Utah Valley University, the University of Texas – Rio Grande Valley, Grand Canyon University and Seattle University — played in the College Basketball Invitational last season. On the women’s side, CBU is on a tear in WAC play, winning eight conference matchups in a row. In addition, the Lancers’ 77.7 points per game is 21st in the nation. CBU was picked to finish eighth in the conference’s preseason poll, but is currently 17-10 and sitting in second place in the WAC standings and outperforming preseason expectations. Lancer wrestling has had its fair share of success this winter, as well, scoring points against No. 22 Stanford and taking first place at the California Collegiate Open in San Fransisco. 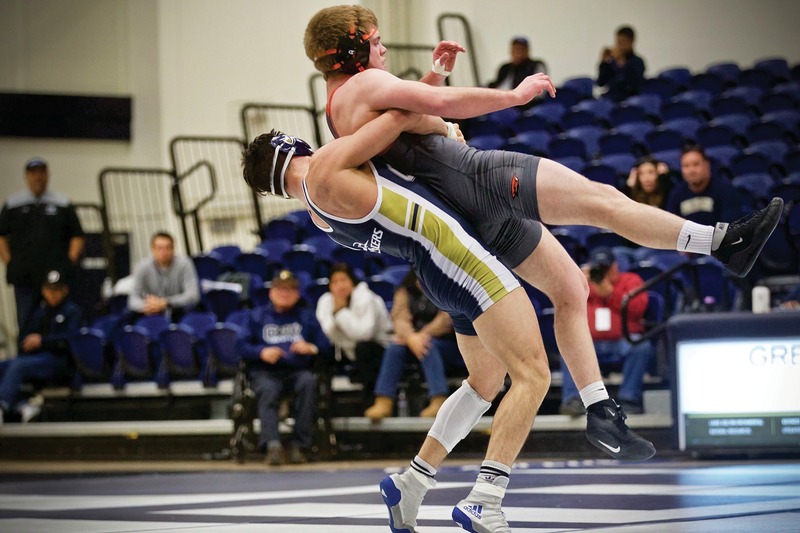 Multiple individual wrestlers impressed in their first DI season. 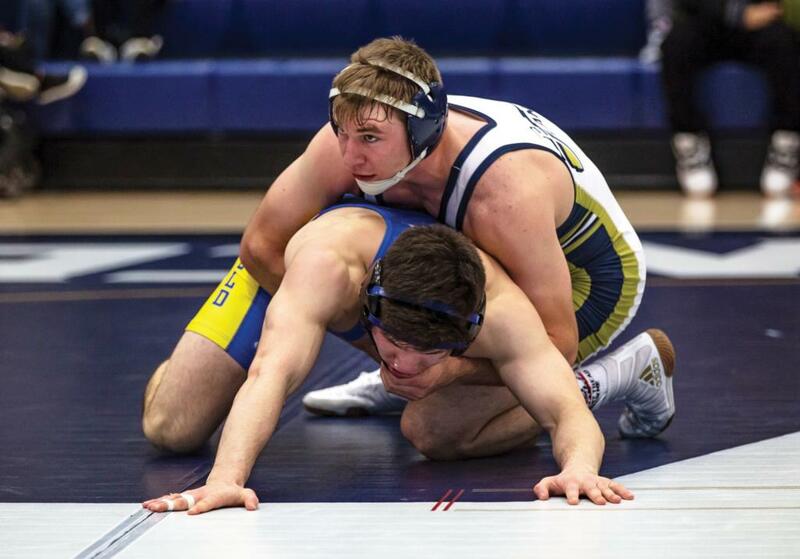 Bryce Buckley, junior accounting major, is 8-7 this season at 174 pounds. Daxton Gordon, senior biology major and Division II national champion, also went 8-7 at 149 pounds. Growing pains were to be expected this year, but no one could have expected the Lancers would feel this at home in a new competition level. 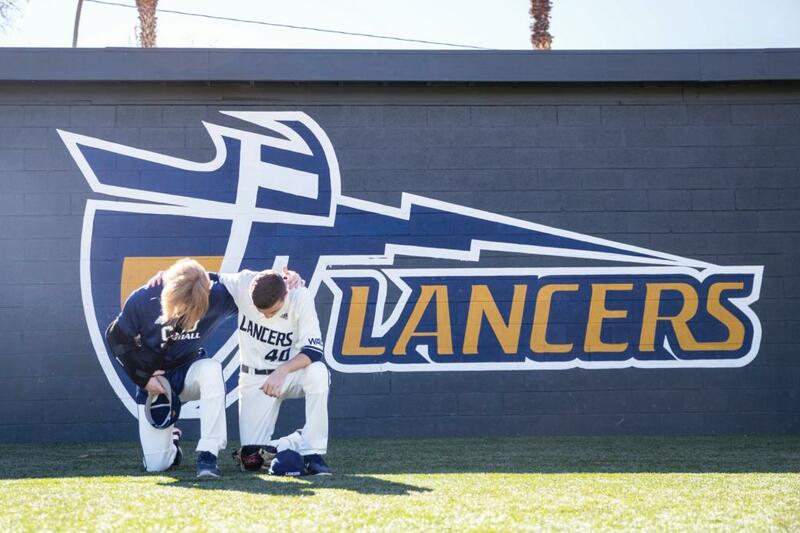 Sage Zbinden | CBU Banner Ryan Silva, sophomore business major, and Austin Johnson, junior criminal justice major, kneel in prayer before California Baptist University’s baseball team makes its home debut as a Division I team. Sage Zbinden | CBU Banner Andrew Bash, junior criminal justice major, pitches in the second game of a double header during CBU’s opening home series against Northern Illinois University. 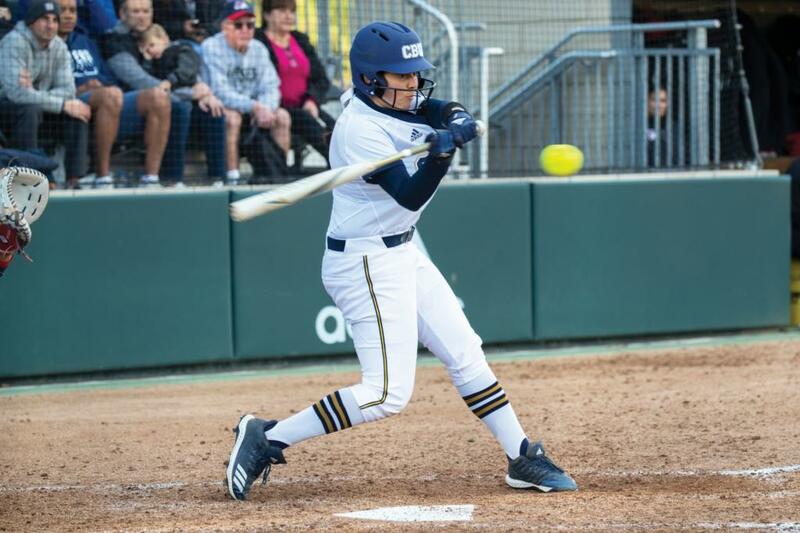 Sage Zbinden | CBU Banner Amanda Argomaniz, freshman political science major, swings at the ball in CBU softball’s home debut as a DI team against Fresno State University. Sage Zbinden | CBU Banner Daxton Gordon, junior biology major, wrestles California State University—Bakersfield’s Kalani Tonge during a match held in CBU’s Van Dyne Gymnasium. 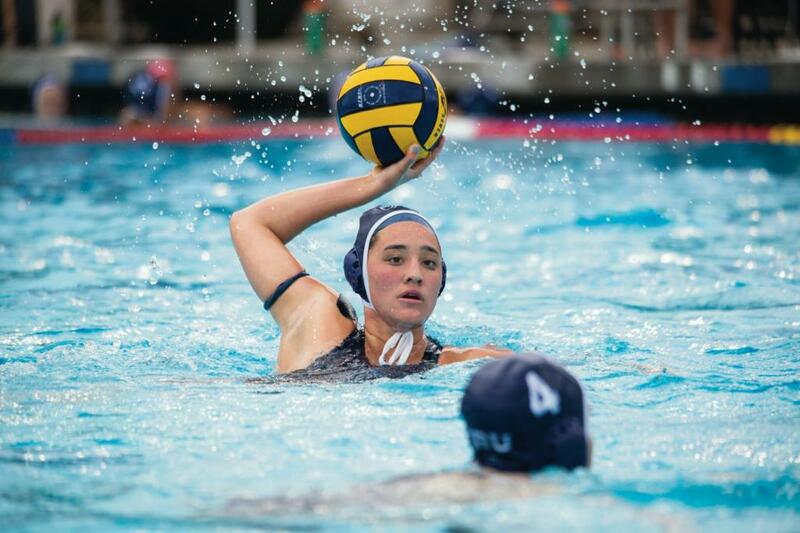 to pass the ball to her water polo teammate.